Through generations of resistance, resilience, and movement, we know that there is a symbiotic relationship between law and culture. The collective consciousness of We The People is both reflected and informed by art and cultural products. Therefore, the role of artists and cultural workers carries great importance and responsibility in creating social/policy change and revolution. The Arts and Culture Caucus of Move to Amend is a space where artists, creative activists, and organizers who want to learn more about creative resistance tactics, come together. We create materials to help folks be creative in their organizing. We support and collaborate with artists who are using their medium to fight corporate power. 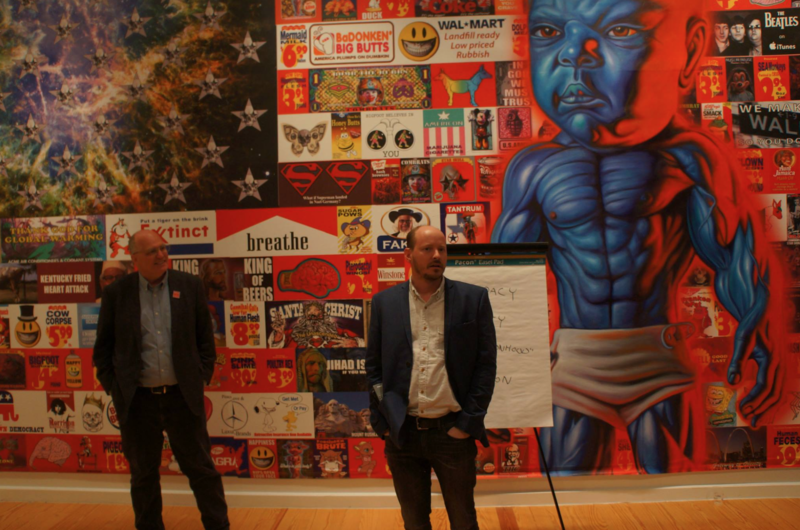 We discuss the power of art and artists and find ways to harness this power to advance the goals of and uphold the principles of Move to Amend. Join us! Calls are the 1st Tuesday at 2pm Pacific / 5pm Eastern. If this will be your first conference call with Move to Amend we recommend you contact us first to chat about your interest in the Arts and Culture Caucus. Call Jessica at 916-318-8040. Corpocracy - a collaborative art and activism project with the Station Museum of Contemporary Art, FixCapitalism.com, and many artists who are fighting corporate rule. Corpocracy shines a light on how the pursuit of profit has drowned out morality, leaving a path of economic, environmental, and socio-political destruction across the globe. The show is possibly the most powerful indictment of corporate corruption in our time. The thirteen featured artists bring us their unique ways of seeing – confronting our everydayness with their work, helping us to see the world as it is. The disease is real. Most of us are trapped in this consumerist world, or we are too numb or exhausted to care. Read an interview with Carl V. Fox, our first featured artist. 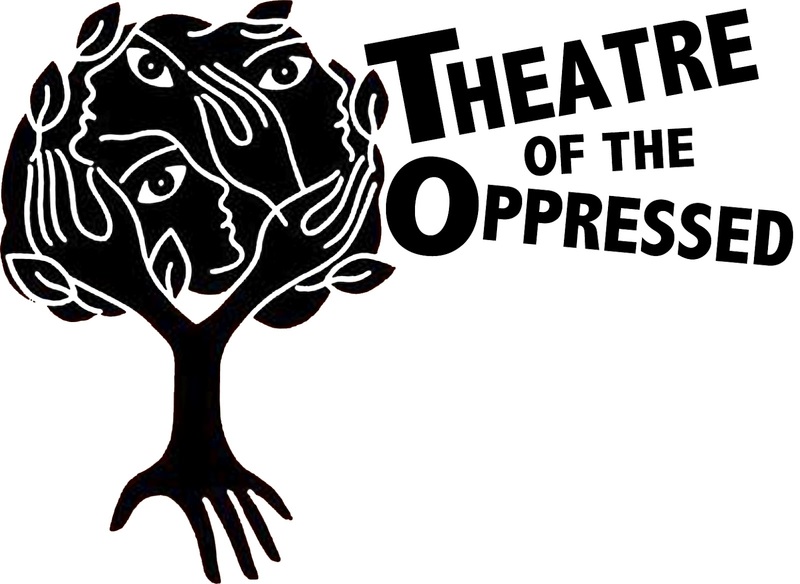 Pedagogy & Theatre of the Oppressed, Inc. (PTO) supports people whose work challenges oppressive systems by promoting critical thinking and social justice through liberatory theatre and popular education. Our vision is to create global access to popular education pedagogy and liberatory theatre of the oppressed methods to support a world based on radical love and social justice instead of oppression and violence. Our approaches stem from the theories and practices of Paulo Freire and Augusto Boal. We foster collaborative connections to share, develop, promote, and document liberatory theatre, popular education, and other revolutionary actions. PTO serves as a resource for oppressed peoples and their allies in diverse communities, contexts, and traditions around the world. Backbone Campaign provides creative strategies, artful action support, and convenes training opportunities for change agents across the United States. Backbone Campaign's Artful Activism is bold, principled, powerful, and invigorates social movements striving for equity and justice. Their purpose is to accelerate the growth of a social movement powerful enough to manifest a world where life, community, nature and our obligations to future generations are NOT for sale, but honored as sacred. Move to Amend and Backbone Campaign are partnering on their upcoming Localize This! Action Camp in June 2016. Learn more HERE! The Crossroads Project brings the power of performance art to bear on one of the great conversations of our time — humanity’s growing unsustainability and the quest for truly meaningful response. At the dawn of the 21st century, humanity has arrived at an extraordinary Crossroads—a time and place where scientific ability to identify unprecedented risk intersects a societal inability to respond. Little of humanity’s course, as currently imagined, is sustainable—not our energy, not our economy, not our environment. But there is more to the scientific message: we are possessed of the knowledge we need to chart a new course, and a tide is rising. David Rovics, folk singer and friend of Move to Amend is launching a new project, The Songs News Network, a daily feed of songs related to current and historical events on May 1 . After spending decades whining about how consistently the media ignores musicians who don't have corporate sponsorship, it occurred to David to do something proactive. He has organized a daily feed of songs related to current and historical events. Of course, whether this network has an impact will depend on the participation of more musicians, and the interest of the broader public, so please like and share the page and the posts that will be forthcoming each day! Sign up and hear what's good on a daily basis. Artists are encouraged to submit songs! Check out these endorsing artists! Move to Amend on Tour! "Over the last year, we, on the 'Rebel Content' tour, have been very fortunate to be accompanied by 100s of grassroots activist groups. These regional and international groups have been doing heroic work on the front lines, getting people informed, engaged and excited about protecting earth and all its inhabitants. We can never be thankful enough for their participation"
Check out our playlist on Spotify of social justice songs that span movements, musical genres, generations, and geographies! We recommend you listen to this playlist on shuffle to mix up the artists. Interested in getting involved with the Move to Amend Arts and Culture Caucus? If you have questions or want to talk, email Jessica Munger at jessica [at] movetoamend.org.